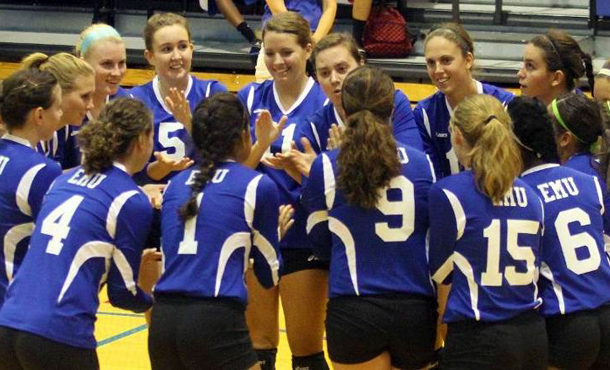 The Eastern Mennonite University (EMU) women’s volleyball team has picked up a prestigious honor, being given the American Volleyball Coaches’ Association (AVCA) Team Academic Award for the 2012-13 season. The AVCA announced that 622 teams, across all college and high school divisions, have earned the award, setting a new all-time high. The Lady Royals had a cumulative GPA of 3.34. EMU was the only school from the Old Dominion Athletic Conference to earn the award. The AVCA Team Academic Award has become one of the AVCA’s fastest growing awards programs, seeing an impressive surge in teams honored over the past several years. Since the 2000-01 season, the number of recipients has increased every single year but one, while amassing an overall 300% increase over the span of the last decade. Since the award’s inception in 1993, the amount of award winners has increased from 62 to its current number of 622. In Coach Jeff Tyson’s first year, Eastern Mennonite finished 4-19 in 2012. They host the six-team EMU Invitational to open the 2013 campaign on Aug. 30 and 31.